Treat yourself to the gold standard in anti-aging skincare—Retinol Advanced Firming Cream—now in a value priced, “more is more” 16 oz. spa size. Generous, convenient pump jar lets you enjoy the industry’s number one clinically proven ingredient at a fraction of the cost, so you can indulge in the best without skimping. Retinol works by stimulating skin cell turnover, resulting in fresh, new skin for a vibrant, youthful look. 16 oz. Compare at $60! Water (Aqua), Mineral Oil, Cetearyl Achohol, Glyceryl Stearate SE, Isopropyl Myristate, Glycerin, Butylene Glycol, Ceteareth-20, Caprylic/Capric Triglyceride, Retinol, Aloe Barbadensis Leaf Juice, Camellia Sinesis Leaf Extract, Anthemis Nobilis Flower Extract, Acrylates/C10-30 Alkyl Acrylate Crosspolymer, Disodium EDTA, Maltodextrin, Phenoxyethanol, Iodopropynyl Butylcarbamate, Caprylyl Clycol, Sodium Hydroxide. Apply a sufficient amount of lotion onto cleansed face, neck and hands. Gently Massage into skin using upward circular motions, paying special attention to the wrinkles, until fully absorbed. Use daily. Caution: For external use only. If irritation develops discontinue use. If lotion enters eye, flush thoroughly with water. If accidently ingested contact a physician. Keep out of the reach of children. I was looking for a good quality retinol with no fragrance! This is definitely the one. I have used perscription Retin A, and have found it to be too drying for my skin. Retin A does have this propensity, even for those with oily skin. This product is perfect. You can use it also on the chest area and hands, arms, and legs. It spreads well and absorbs quickly. My skin loves it. Definitely a must have! And the price is a big bonus! I like the way it soaks into my face and doesn't feel greasy like some face creams. It makes my face feel smooth not dry or oily. I would buy this product again and again. I swear by it! I use the cream every morning and evening after removing makeup. Especially great for my aging skin. It keeps my face, chest and nice smooth and clear. I have not found any negative issues using this cream. I was pleased to find a reliable source for purchasing, since I could not find it in my area. I use minimal amount of cosmetics and this cream is not greasy and l love it. to use and unlike others I've tried, I look forward to using it and seeing great results!!! I use this cream on my arms and legs mostly but sometimes on my neck. It is easy to apply and feels great. Have been using nightly for past several weeks. I apply at bedtime to face & hands. The product leaves your skin feeling nice, not greasy, but as for any firming properties for your face or chin? No change noticed. So, if you just want a nice, light cream to apply at night, this is great, but as for any other qualities, it is no different than any product you can buy at the grocery store or chain store. Water, Mineral Oil, Cetearyl Achohol, Glyceryl Stearate SE, Butylene Glycol, Glycerin, Aloe Barbadensis Leaf Juice, Isopropyl Myristate, Ceteareth-20, Caprylic/Capric Triglyceride, Retinol, Camellia Sinesis Leaf Extract, Anthemis Nobilis Flower Extract, Triethanolamine, Acrylates/C10-30 Alkyl Acrylate Crosspolymer, Disodium EDTA, Phenoxyethanol, DMDM Hydantoin, Iodopropynyl Butylcarbamate. I started noticing wrinkles on my neck and other creams I used were not helping. This cream is wonderful! I have definitely noticed a difference in the skin on my neck within a week of using it. Hopefully, this will help my aging skin. Plus, the price seems right. I have used it as nite cream and I like it. I chose this because I use the Retinol eye gel and it works quite well for me at age 77. So thought I'd try this, too. Reorder. I like the smoothness it gives my skin. I have very sensitive skin and decided to try this cream. It actually works for me. So far, I have not experienced any skin sensitivity. Therefore, I’m recording this cream. Also, it is cost effective. All firming creams that I’ve used in the past are very expensive. It contains retinol and is reasonably priced. Used before. It really works. It keeps my face moisturized and looking good. I love my skin after applying it. I have read that Retinol is one of the best for wrinkles. Glad to get such a big jar at reasonable price. Nice cream; used daily. want more. I have been using it and like the results and the way my skin feels. My dermatologist recommended retinol, and this is a great price. To help protect my skin. I thought I would combine it with the Collagen for all round protection, and you can't beat the price. safe for all skin types? BEST ANSWER: Thank you for your question. The Retinol Advanced Firming Cream should be safe for all skin types as it simply stimulates skin cell turnover. We hope this will be helpful. I have sensitive skin and it works for me. I hope this helps. BEST ANSWER: Thank you for your question. We have included below a listing of the ingredients of this item. We hope this information will be of help to you. i have used a glycolic rejuvenation cream will retinol cream work as well? I my self csn tell you that the Retinol cream is a really good product it make you skin soft and glowing plus the softness and firmness it gives your face and neck plus your hands these cream really works..
Also I recommend the aragain oil and the collegen if you love perfection this is the way to shop just follow the instruction as it is and wellcome to the the club. Not sure! 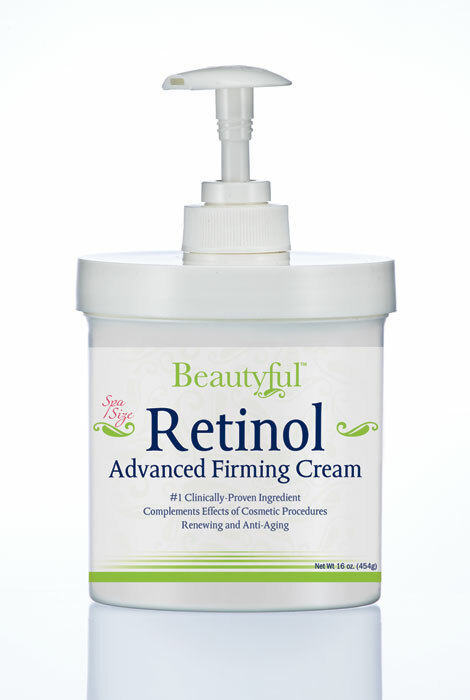 But Retinol Advance Firming Cream works for beautiful for me. I ordered all of them and they both work well. can it be use in the body? BEST ANSWER: Thank you for your question. The Retinol Advanced firming cream is only made to be used on the body. It is not made for ingesting. We hope this information will be of help to you. I see someone else mentioned they could not get the pump to work. I bought both this and the Collagen creams and try as I might, I can not get the pump to pop up so I can use it. I have to open the jar itself. Is there a secret to getting the pump to rise up? after using advanced firming cream, do I use a moisture cream and then foundation makeup or delete moisture cream and apply foundation makeup? BEST ANSWER: Thank you for your question. You can try it either way, as long as you put the firming cream on first and let it absorb before putting on your other products. We hope this information will be of help to you. BEST ANSWER: Thank you for your question. This is a cosmetic, not a drug product. The manufacturer does not claim any biological activity and therefore does not claim that the product contains a certain number of IU’s or a percentage of Vitamin A (retinol). It is in the product at cosmetic levels. We hope this information will be of help to you. BEST ANSWER: Thank you for your question. This is a cosmetic, not a drug product. The manufacturer does not claim any biological activity and therefore does not claim that the product contains a certain number of IU’s. It is in the product at cosmetic levels. We hope this information will be of help to you. this is for the face, correct? BEST ANSWER: Yes it is I also apply to my neck. I really am happy with this product. The lotion does not leave your face feeling greasy. Love the Retinol & Coconut Oil products. Can you tell me how to best use each of the products -- collagen, AHA plus retinol & coconut oil? i.e., am vs pm?